When I visited Kyiv at the end of May, the Ukrainian capital was buzzing with preparations for the upcoming Euro 2012 soccer championship. Four cities in Ukraine will be hosting matches; the tournament comes to Kyiv on June 11th. Construction was everywhere, many streets were closed to cars, the traffic was near-constant, and there was a palpable sense of excitement and anticipation in the air. Kyiv is a fascinating city whose long history was shaped by its strategic position at the junction of East and West. It has been an important economic and cultural center since its founding in the ninth century, and played a key role in the development of Eastern Slavic culture. It’s also a beautiful city. Perched on the banks of the Dnieper River, the city boasts long stretches of parks and gardens overlooking the water. On the drive into the city, you can catch a glimpse of the gleaming golden domes of the city’s many churches and monasteries peeking through the lush greenery. Three of Kyiv’s most famous religious landmarks are within easy walking distance of each other. St. Michael’s Golden-Domed Monastery centers on a baby blue Ukrainian Baroque cathedral with, as its name would suggest, a shining cluster of gilded domes. St. Sophia’s Church is located nearby to the southwest, and is one of the city’s most famous landmarks. 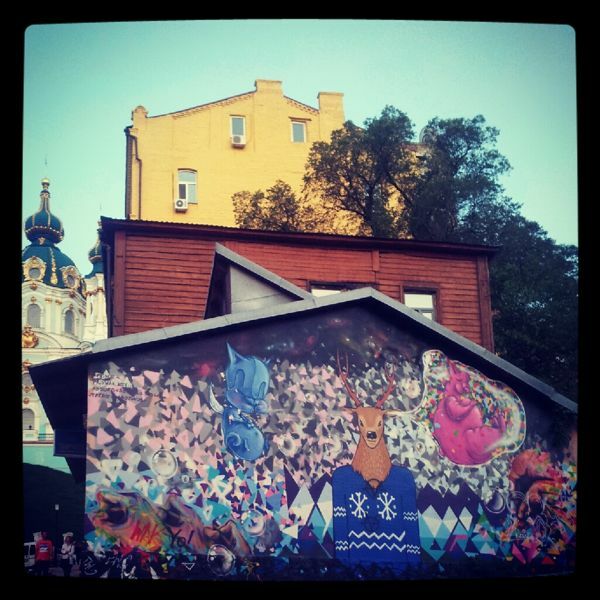 It is one of Kyiv’s two UNESCO World Heritage sites, and contains original mosaics and frescoes from the 11th century. To the north lies St. Andrew’s Church, a baroque structure with ornate domes that resemble crowns. St. Andrew’s Church is perched at the top of Andriyivskyy Descent, a picturesque cobblestoned road that has been nicknamed “Kyiv’s Montmatre.” Unfortunately, a recent round of reconstruction has led to the destruction of many historic buildings and threatens to alter the unique character of this neighborhood. 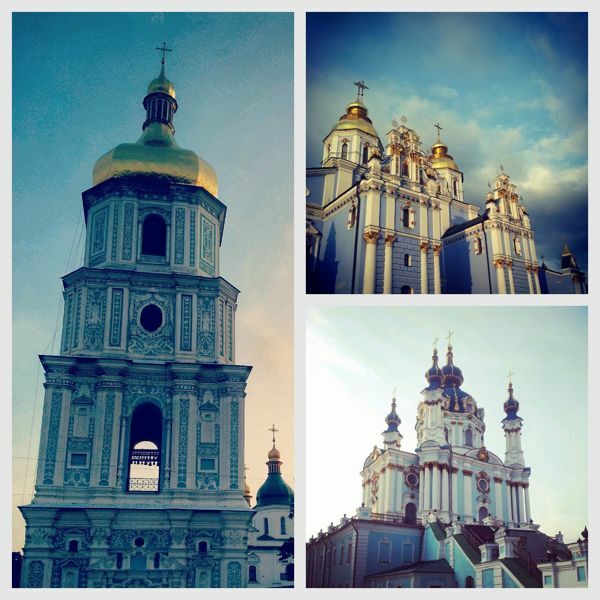 The Pechersk Lavra (Monastery of the Caves) is historic monastery in Kyiv. 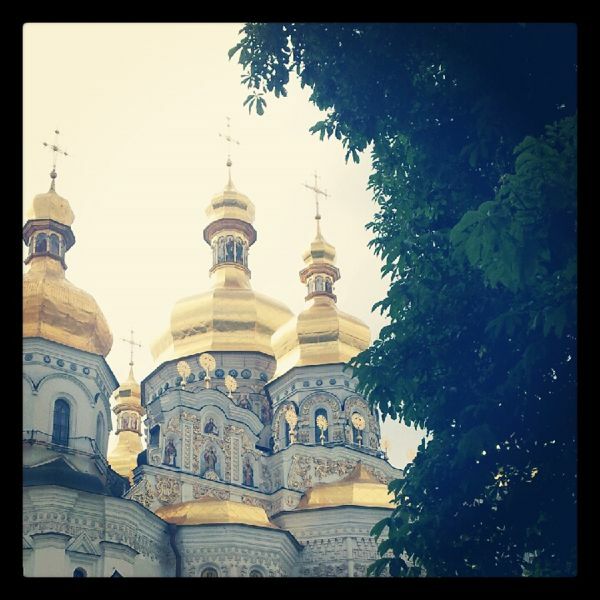 It is the holiest site in Ukraine, and one of the most important centers of Eastern Orthodox Christianity. The monastery was founded in the 11th century, when St. Anthony settled in a cave overlooking the Dnieper River. Since that time, the monastery has expanded into an intricate underground labyrinth of caverns, along with above-ground churches and cathedrals. Kyiv Pechersk Lavra is Kyiv’s other designated World Heritage site. 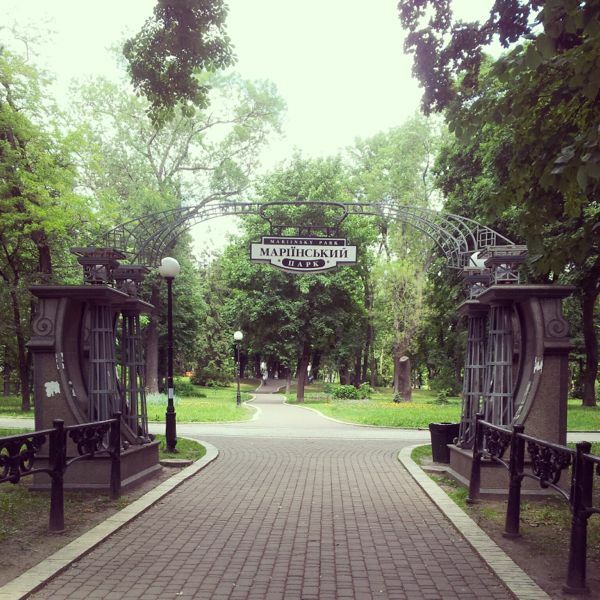 The Central Recreation Park actually consists of several linked parks that follow the left bank of the Dnieper River. It’s a beautiful spot for an evening stroll. Lovers curled up on benches, women strutting in impossibly high heels, teenagers practicing agility tricks on roller blades…everyone comes to the park to unwind and grab a cone of ice cream. 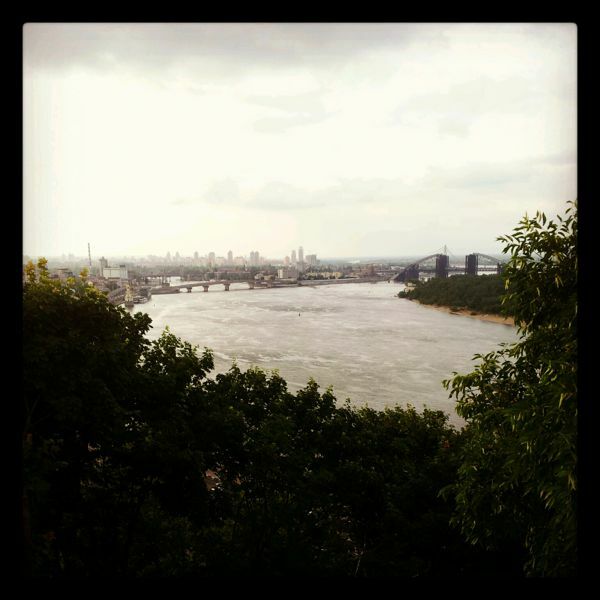 Khreschatyk Gardens offer sweeping views of the Dnieper River from a large viewing platform. The nearby Friendship Arch commemorates the relationship between Ukraine and Russia, and at after sunset lights transform it into a massive rainbow. Mariyinsky Park is a formal garden near Mariyinsky Palace, the official residence of the president of Ukraine. It’s a lovely spot full of winding paths and shade trees. On any given day you’ll likely catch some Kyivan newlyweds snapping their wedding photos here. This year, Kyiv is hosting its first ever international biennale of art–the Kyiv Arsenale. The exhibition is located in an old military building that was converted into a museum, the Mystetskyi Arsenal (Art Arsenal). It’s an impressive, open space with whitewashed brick walls and arched, cathedral-like ceilings. The Arsenale features works by international superstars like Ai Weiwei and Yinka Shonibare, but also represents Ukrainian and Eastern European artists as well–many of whom display projects that are preoccupied with the rocky transitions of the post-communist period. The Kyiv Arsenale runs through the end of July 2012. Although food in Kyiv is already comparatively cheap, Puzata Khata (Hut of the Pot Belly) is where you’ll get the most bang for your buck. This self-service cafeteria serves up heaps of traditional Ukrainian food. There are enough options to satisfy carnivores and vegetarians alike. Vernissage is a nice place to stop after exploring St. Andrew’s Cathedral and Andriyivskyy Descent. Owned by a Frenchman, Louis Chambody, this restaurant was the first of what is now a chain of artsy bistros. The menu has an eclectic (and tasty) mix of French, Thai, and Ukrainian dishes. Charming is the first word that comes to mind when describing Kureni. The restaurant’s outdoor seating is spread out on terraces overlooking the river. The tables are nestled in cozy, curtained wooden huts. Kureni serves delicious Ukrainian dishes with impeccable presentation. It’s the perfect place to sit and watch the sun go down after a full day of sightseeing. This entry was posted in Cities, Explore and tagged Andriyivskyy Descent, arsenale, camilla, eastern europe, europe, explore, Khreschatyk, kiev, kyiv, Mariyinsky Park, Pechersk Lavra, slavic, travel, ukraine.